Our AGM (Annual General Meeting) for 2018 will take place on Saturday 15th September in the lovely Tailors’ Hall (An Taisce’s HQ) on Back Lane, very close to Christchurch Cathedral - see here. We’ll have tea/coffee available at 1.30pm and will start the AGM at 2pm sharp. You can also pop along from 1pm if you want to help us with setting up the room! Our AGM (Annual General Meeting) will take place on the evening of Monday 10th July 2017. If you make it to just one meeting this year, make it the AGM! You’ll get a great summary of our activities over the last year and help to shape plans for the next year. We will also be unveiling and discussing our new Strategy 2017-2020. Details to follow soon. A sincere thanks to Donnacha Carroll for his super lovely art work and design of the poster! A review of the past year and look to the future. The Annual General Meeting is a great opportunity for new people to get involved in the Campaign and to help change the city for the better. 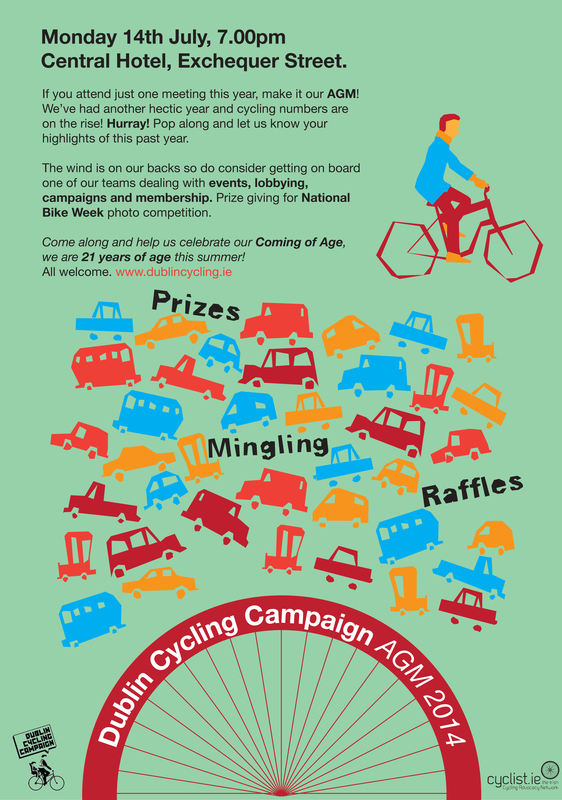 Don’t miss Dublin Cycling Campaign’s AGM on July 13th! We’ll be reviewing the last year and planning for the next one. Do pop along and let us know your thoughts on what we should be prioritizing for the next year. Lots of mingling and chats afterwards in the Library Bar! Note the earlier start time of 7pm. A big thanks and shout out to Donnacha for designing the fab poster! 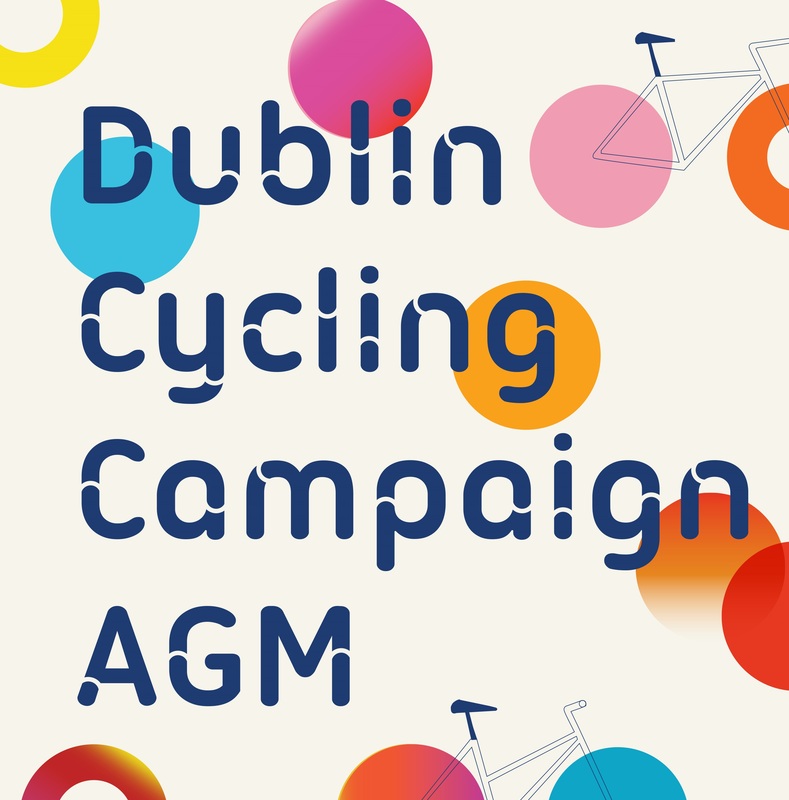 Dublin Cycling Campaign’s AGM takes place on Monday 14th July @ 7pm. DCC has grown to become one of the most vibrant campaigning bodies in Dublin and we are succeeding in bringing about positive change in the city. Do come along to the AGM and contribute your energy and ideas to our work. This event also doubles-up as one of our main social events of the year. Not to be missed! Dublin Cycling Campaign held its 2013 AGM on Monday 08th July 2013. 7.30pm. 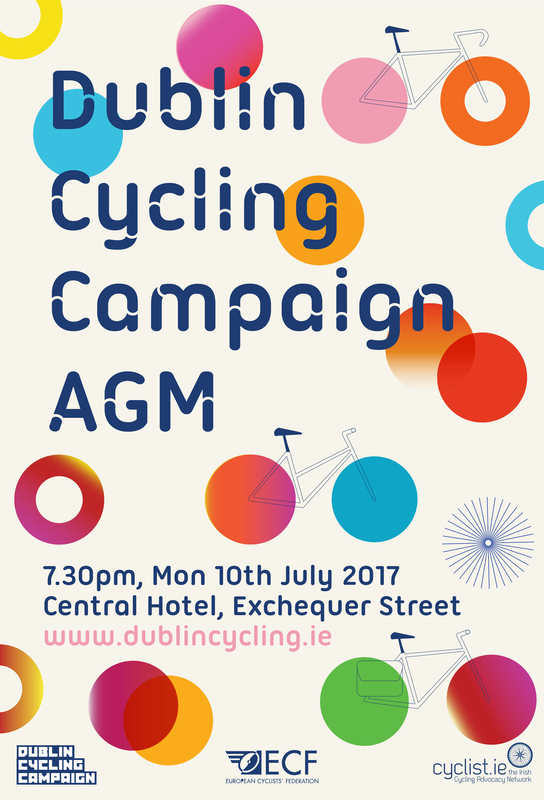 AGM of the Dublin Cycling Campaign. A review of the past year and look to the future. And an opportunity new people to volunteer for roles within the campaign. The AGM is a great opportunity for new people to get involved in the Campaign and to help change the city for the better.